Obama questioned the ability of GOP presidential nominee Donald Trump to protect Americans. President Barack Obama on Wednesday night told Americans they face a stark choice in November ― an unusual election that has raised “fundamental” questions “about who we are as a people,” and pitted one of the most qualified candidates in history, Hillary Clinton, against an untrustworthy con man, Donald Trump. 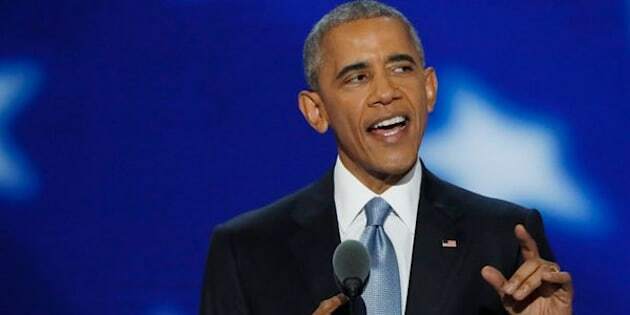 In a Democratic National Convention speech that was at turns emotional and blistering and ended with Clinton appearing by his side, Obama began with a recitation of his accomplishments in office ― reducing unemployment and saving the auto industry, passing health care reform, a nuclear agreement with Iran and the killing of Osama bin Laden. President Barack Obama made his case for Hillary Clinton for president Wednesday night. “The America I know is full of courage and optimism and ingenuity,” Obama said, contrasting this vision with the dark, pessimistic message that came from the Republican convention in Cleveland last week. After laying out those two visions, Obama made his case for Clinton, reminding people not only of her experience and expertise but also of her record of championing groups such as children and veterans. And then it was time to talk about Trump. Previous speakers ― including Vice President Joe Biden and vice presidential nominee Tim Kaine ― had already worked up the crowd. Obama picked up where they left off ― at first, by adopting the same mocking tone he’d used in 2011 at the White House Correspondents Dinner. But the strongest part of his speech came at the end ― when, after painting Trump as somebody who doesn’t believe in America, Obama reasserted his own belief that democracy can work and that, given the chance, they will make the right choices for the country. Obama’s speech brought the partisan crowd to its feet ― and the roars grew louder when Clinton made her dramatic, if predictable, entrance onstage to join him. The two exchanged words, embraced and then stood on the stage soaking in the applause as the convention’s third night drew to a close. Clinton joined Obama onstage after his speech Wednesday.